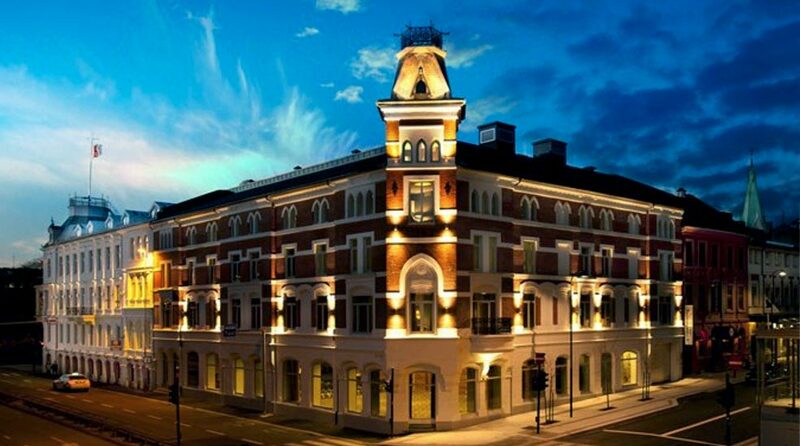 Clarion Hotel Ernst is a hotel with that little extra – right in the centre of Kristiansand. The building's traditional architecture is combined with exciting contemporary art and international design. Welcome to the coolest hotel in Sørlandet! Clarion Hotel Ernst is located in central Kristiansand. You'll find us just a few steps from the Marken pedestrian area and from here you'll be within walking distance of Bystranda beach, Fiskebrygga fish market, Odderoya island and the Kilden Performing Arts Centre. The train station and bus terminal are just a few blocks from the hotel, and the airport bus takes you straight from Kjevik Airport. You can read more about Kristiansand here. Clarion Hotel Ernst is cash-free, which ensures added security for our guests and visitors. More information about this can be found under FAQs. Breakfast, lunch and dinner are served in the hotel restaurant. The bar, Club Clarion, is right next to the hotel's spectacular atrium, with its emphasis on music and its wonderful atmosphere. Exercise before breakfast or a relaxing sauna session after a long day? Welcome to our relaxation area. We have a number of specially configured rooms for our disabled guests, designed to make your stay easier and more comfortable. Contact us for more information about our handicap rooms and facilities. Clarion Hotel Ernst was completely renovated and re-opened in the spring of 2012. The hotel's rich traditions have been preserved, but are now combined with modern, international design and exciting contemporary art. "Staying at Clarion Hotel Ernst used to be like staying at a manor house or a luxury villa. These days, we want to convey more of a sense of being in touch with the whole world. We're in Kristiansand, but this interior and art could just as easily be found in New York or Paris," says Sune Nordgren, the man behind the artistic concept. We wish you a warm welcome to Clarion Hotel Ernst – the vibrant meeting place in Kristiansand. Train to Kristiansand train station. Bus to central Kristiansand bus terminal. We recommend Agder Taxi and Taxi Sor who charge a fixed price from the airport to the hotel.